The full potential of thermoelectric, phase change memory and IR sensor devices is currently held back by the inability to deposit functional materials with the required quality, component size, complexity and control. Our previous work shows that electrodeposition from weakly coordinating solvents can deliver practical device structures combining these features. This is the vision of the ADEPT EPSRC programme grant led by Professor Phil Bartlett FRS with leading researchers at the Universities of Southampton, Nottingham and Warwick. Electrodeposition, the use of an electric current to deposit a material at a conducting surface, was first described by Brugnatelli in 1805. His gold coatings on silver medals illustrate some advantages of the technique: (1) Deposition occurs in locations defined by electrical contact; (2) Efficient volume filling results in a solid gold layer; (3) Electrical control of the deposit thickness; (4) Conformality, faithfully reproducing the features of the medal. Future production of electrically contacted individual devices with feature sizes smaller than those currently produced by top-down techniques will require controlled bottom-up methods. The Damascene process pioneered by IBM1 and used to electrodeposit copper interconnects on silicon chips has been essential to the progress of VLSI to its current level. This process is fully integrated into microfabrication. Electrodeposition can produce very high purity materials, e.g. epitaxial magnetic films with a quality equal to those prepared by molecular beam epitaxy.2 Single and multi-component devices can be deposited into track etch structures or anodic alumina membranes with pores >30 nm using water or ionic liquids.3 However, much of the state of the art in electrodeposition into very small features for nanodevice fabrication lies in our work as described below. Our patented electrodeposition processes4 from bespoke precursor compounds can produce a range of elements5 and compound semiconductor compositions with exceptional control and purity. 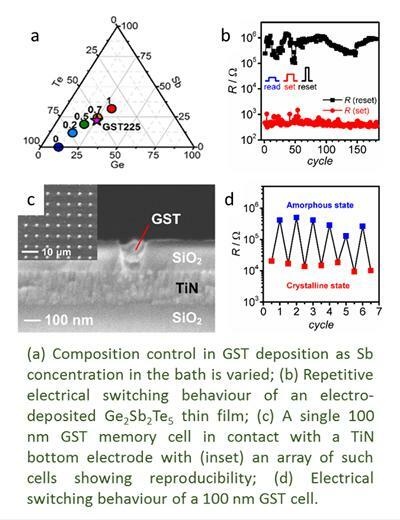 For example, we have produced Ge2Sb2Te5 (GST) phase change memory films with excellent switching properties.6 The figure shows the deposition of GST into a single memory cell with 100 nm dimensions and its electrical switching over several write/reset cycles. Such individual cells have significant advantages over a solid film including stability deriving from reduction in thermal cross-talk and the possibility of increasing the number of devices per unit area. There is great scope to further develop electrodeposition of compound semiconductor materials as a practical deposition technology, to make thermoelectrics and IR sensors and to scale down the size of phase change memory cells. In the production of very small devices electrodeposition can go beyond the capability of techniques such as ALD: feature sizes of 2-3 nm are well within reach and material deposition can be carried out into a variety of device architectures – we just need an electrical pathway. In the Supercritical Fluid Electrodeposition programme (www.scfed.net)7 we have demonstrated that electrically-contacted nanowires of a range of materials can be grown in templates with sizes down to a few nanometres. 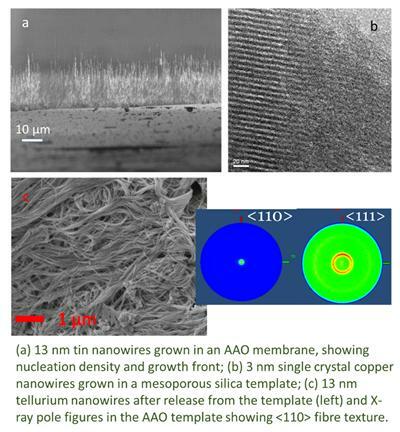 Much of this work has been carried out in anodically etched alumina (AAO) membranes, where 13 nm wires with high aspect ratio are routinely prepared (right).8 However, under these conditions we have published the growth of 3 nm copper nanowires (right) into mesoporous silica films and have recently shown that 1.5 nm tin wires can be grown into well aligned mesoporous silica. These depositions go well beyond what can be achieved by vapour phase growth methods both in the size and in the aspect ratio of features that can be produced. •	Alloy control: delivery of specific compositions, doping at a chosen level and production of interfaces between materials. •	Structure control: the right crystal structure, with nanocrystalline to single crystal microstructures and specific crystal alignments as appropriate. •	Surface control: in small devices the surface is critical and it is essential to be able to choose to passivate surface states or to dope the surface in a functionally relevant manner. •	Integration: a strength of electrodeposition is growth of the material at a specific electrically connected site. We will pioneer deposition into chips and demonstrate feasibility of integration with other fabrication processes. Our team combines the key expertise areas to deliver on these challenges: electrochemistry (Prof Phil Bartlett, Southampton), synthesis of reagents (Prof Gill Reid, Southampton), fluid behaviour in pores (Prof Mike George, Nottingham), growth templates (Prof Andrew Hector, Southampton), functional characterisation (Prof David Smith, Southampton), electron microscopy (Dr Richard Beanland, Warwick) and device fabrication (Prof Kees de Groot, Southampton). 1P. C. Andricacos et al, IBM J. Res. & Dev., 1998, 42, 567. 2W. K. Schindler, J. Phys. Rev. B, 1997, 55, R1989. 3X.-J. Wu et al, Coord. Chem. Rev., 2010, 254, 1135. 4International Patent WO 2014/016544 A2, US and EU patents in progress; further patent pending (application 1509712.4). 5P. N. Bartlett et al, Chem. Eur. J., in press. 6P. N. Bartlett et al, Mater. Horiz., 2015, 2, 420. 8J. Ke et al, Proc. Natl. Acad. Sci., 2009, 106, 14768.